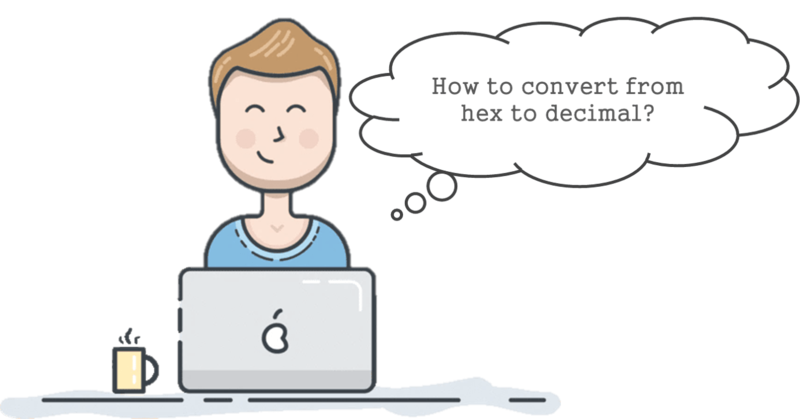 This online hex to decimal converter tool helps you to convert one input hex number (base 16) into a decimal number (base 10). Hex numeral system (also called hexadecimal) has 16 digits, include (0, 1, 2, 3, 4, 5, 6, 7, 8, 9) just like decimal numeral system, plus (a, b, e, d, e, f) 6 additional characters. Which means it's is a number system of base 16. Since Hex numeral system can represent any binary string in a readable way, It is widely used in computer science. The SHA256 hash string is often appears as Hex style string, the Color System used in HTML is also be written down as Hex number, from #000000 (pure black) to #FFFFFF (pure white). Decimal numeral system (also called Hindu-Arabic, or Arabic) has 10 digits, include (0, 1, 2, 3, 4, 5, 6, 7, 8, 9), it's the most used number system in our daily life. Decimal numeral system is also one of the most ancient number system, it's inspired by 10 fingers of human. How to convert from hex to decimal? For each digit in hex numeral system (base 16), equals to each digit multiply by its position power to 16 in decimal numeral system.